I started by looking at how the characteristics of our learners are changing, and followed that by examining how our perspectives on content are being influenced by the digital age, how both intellectual and practical skills can be developed to meet the needs of a digital age, and the importance of learner support within the learning environment. In subsequent posts, I will cover resources and assessment respectively. In this post, I examine how resources can and do influence the learning environment and ultimately the design of teaching and learning. Resources available to teachers/instructors and the learners are a critical component of an effective learning environment. As in the case of learner characteristics, an instructor may not have a lot of control over the resources available to him or her, but resources (or the lack of them) will impact a great deal on the design of teaching. Fighting for appropriate resources is often one of the most challenging tasks for many teachers and instructors. At the same time, of all the components, resources reflect some of the greatest changes resulting from a digital age. 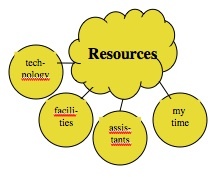 I define teaching assistance as people such as adjunct or sessional instructors, teaching assistants, librarians, and technical support staff, including instructional designers, media producers and IT technical support. An institution may have policies or guidelines about how many support staff an instructor can have for a set number of students. It is important to think about the best way to use supporting staff. In universities, the tendency is to chop a large class into sections, with each section with its own sessional instructor or teaching assistant, which then operate relatively independently, with often large differences in the quality of the teaching in different sections, depending on the experience of the instructor. Furthermore, online learning may bring in more revenues through government grants for extra students and/or direct tuition revenue, so there may be economies of scale which would enable the institution to hire more sessionals from the extra revenues generated by the additional online students. Indeed, there are now examples of fully online masters programs more than covering the full cost, including the hiring of research professors to teach the program, from tuition revenues alone (the University of British Columbia’s online Master in Educational Technology is one example.) Thus design can influence resources, as well as the other way round. Online learning can free instructors and students from such rigid physical constraints, but there is still a need for structure and organization of units or modules of teaching, even or especially when teaching online (see Is content still important in a digital age?). The development of new technologies, and especially learning management systems, lecture capture, and social media,have radical implications for the design of teaching and learning. This will be discussed in much more depth in Chapter 7, but for the purpose of describing an effective learning environment, the technologies available to an instructor can contribute immensely to creating interactive and engaging learning environments for students. However, it is important to emphasise that technology is just one component within any effective learning environment, and needs to be balanced and integrated with all the other components. The greatest and most precious resource of all! Building an effective learning environment is an iterative process, but in the end, the teaching design, and to some extent the learning environment as a whole, will be dependent on the time available from the instructor (and his or her team) for teaching. The less time available, the more restrictive the learning environment is likely to be, unless the instructor’s time is very carefully managed. Again, though, we shall see in Chapter 7 that good design takes into account the time available for teaching. Nothing drives an instructor to distraction more than trying to juggle with what are perceived as inadequate resources. Certainly, if a teacher or instructor is allocated a class of 200 students, with no additional teaching support, and an expectation that the class will be taught as a unit with six one hour lectures a week allocated to a large lecture hall, then the instructor is going to have difficulty creating a rich and effective learning environment, because the lack of resources limits the options. On the other hand, an instructor with 30 students, access to a wide range of technology, freedom to organise and structure the curriculum, and with support from an instructional designer and a web designer, has the luxury of exploring a range of different designs and possible learning environments. are there other resources that influence the design of an effective learning environment that I should have included? Winston Churchill once said ‘We shape our buildings and in turn our buildings shape us.’ To what extent do you think online learning can free us of some of the constraints that buildings impose on the design of teaching and learning? What new constraints does online learning bring in terms of design? how do you feel about the whole issue of teaching assistance? I have grave reservations myself about the use of students as teaching assistants in universities, in terms of the quality of the teaching. I also believe that sessionals and adjunct instructors are badly treated in terms of how they are managed. In British Columbia we have had two Supreme Court cases and a major teachers’ strike over class size and composition, and in particular how much help school teachers should receive for coping with students with learning disabilities. But by bringing in less qualified (and cheaper) support for instructors, do we strengthen or weaken the learning environment for students? Or any other comments on resources as a critical component of a learning environment, please! Assessment as a key component of an effective learning environment.